I like to have a well-stocked pantry, and that includes good quality canned tomatoes and tomato sauce. 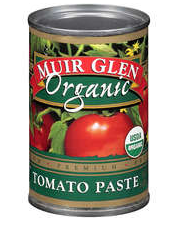 Muir Glen has a great line of organic canned tomato products, and there is a coupon right now at Coupons.com for $.50 off any Muir Glen product. There is no size restriction, so you should be able to get a great deal, especially if your store doubles coupons. Click here for the coupon. You may need to search through the food coupons to find it. Act quickly because good coupons like this one don’t last long. Here are a few of my recipes that work well with Muir Glen products: chicken picadillo, homemade pizza sauce, and vegetarian chili. When Mystie Winckler of Simplified Pantry contacted me about reviewing her e-book, Simplified Dinners, I was happy to oblige. Dinnertime can be complicated, so I’m always eager to hear how other people deal with this stressful time of day. It can be difficult to plan meals days or weeks in advance, but Mystie shares her great approach to this dilemma in Simplified Dinners. This 30-page e-book is packed with useful information about how to get dinner on the table without a fuss. Rather than focus on specific recipes for meal planning, she has a process for different types of meals. By keeping a well-stocked pantry, you can put together many meals without following a recipe. Her streamlined pantry list allows her to do grocery shopping effortlessly because she can easily pass by the many items in the store that aren’t on her master list. The bulk of the book contains processes for various types of meals. For example, the author provides six slow cooker chicken meals, five sauces for a simple stir fry, and nine bean soups with stove top and slow cooker processes. I enjoyed reading through all her combinations, and I was impressed by how many simple meals she mapped out throughout the book. At the end of the book, Mystie offers a sample winter menu plan. Rather than planning specific recipes, she plans general meals like “soup, salad, bread” and fills in the details depending on what she has on hand. This allows her to plan out a month’s worth of dinners at one time. As hard as I try, meal planning can be my Achilles’ heel when my schedule gets busy. I find that my most successful meal plans (i.e. those that don’t stress me out) are somewhat vague, with meal items like “quiche” or “pasta.” I can always figure out what goes in the quiche or pasta when the day comes, and this approach helps me to accommodate the unexpected vegetables that come home from my farm share. I appreciate Mystie Winckler’s perspective on this topic, and I will definitely be trying some of her suggested meals. I hope you’ll check out this unique approach to meal planning. If you’re interested in buying the e-book, click here for more information. The author is offering a discount code that will give you $3 off the cover price of $12.99. The code is “realfood” – two of my favorite words! Disclaimer: I received a free copy of this book for purposes of review. I recently shared my skepticism about the phrase, “An apple a day keeps the doctor away.” Don’t get me wrong, though. I absolutely love apples. 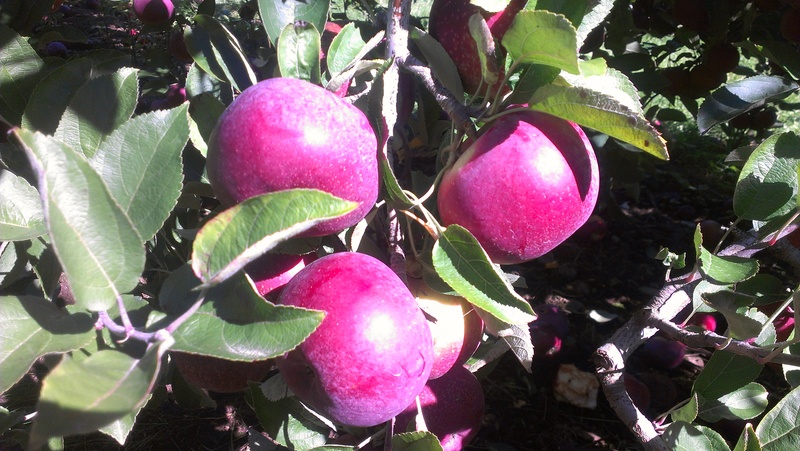 We went apple picking last weekend and picked 20 pounds of empire apples. Half of them are gone already, and I’m wondering if I’ll be able to get back out to an orchard before all the apples are gone. I haven’t even had the chance to make apple pie or apple crisp yet. 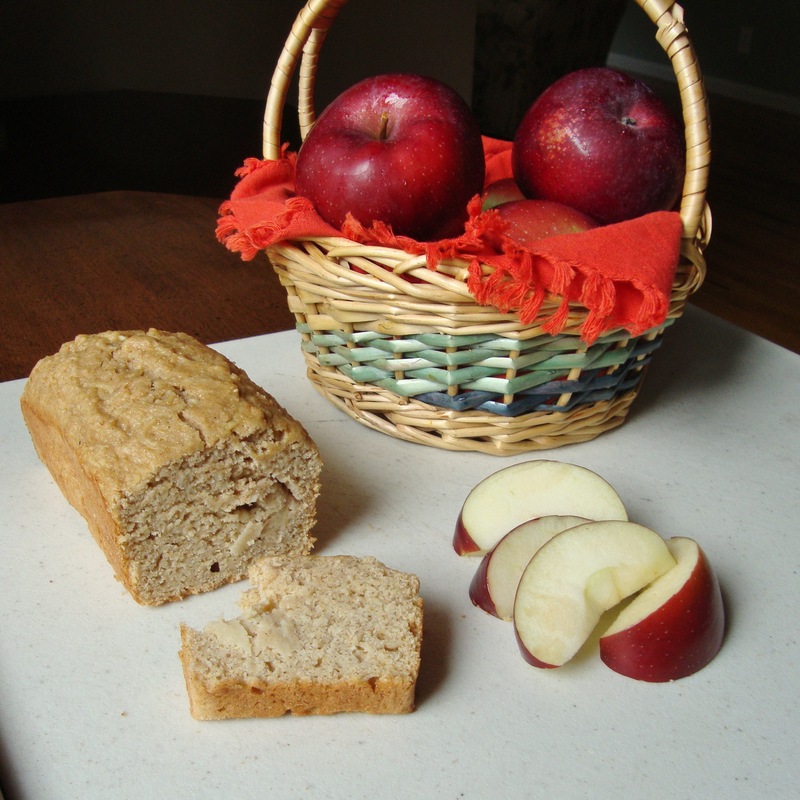 I welcomed this enormous bag of apples into our home by making a batch of apple cinnamon bread. This is such a delicious treat, and it’s perfect with a cup of tea or coffee on a cool autumn morning. By grating the apples rather than cutting them into chunks, I get an even distribution of apple flavor throughout the bread. This is a whole wheat version, but the bread is also delicious with gluten-free flour. The smell of cinnamon coming from the oven is a comfort for me as I brace myself for the cold weather that’s already beginning to sneak its way into my house. Preheat the oven to 350 degrees and grease 2 medium loaf pans or equivalent. (I used 2 mini-loaf pans plus a 12-muffin pan). Add the dry ingredients to the wet ingredients and stir to combine well. Bake until a toothpick inserted in the middle comes out clean (45-50 minutes for a medium loaf pan; 30-35 minutes for a mini-loaf pan; 18-25 minutes for muffins). This recipe costs a total of $6.69 to make, or $.28 per serving. The apples were $.99 per pound, and we picked them ourselves from a local orchard. I love that this recipe allows me to stock up on a healthy snack. I put half the batch in the freezer, and I can put them straight from freezer to lunch box on a day when I don’t have something else on hand. If you’re looking for other apple recipes, check out my blueberry apple crisp, fermented maple applesauce, and apple pie bread. Linking to Ingredient Spotlight, DIY Thrifty Thursday, Eat Make Grow, Keep It Real Thursday. I can’t stress this enough. 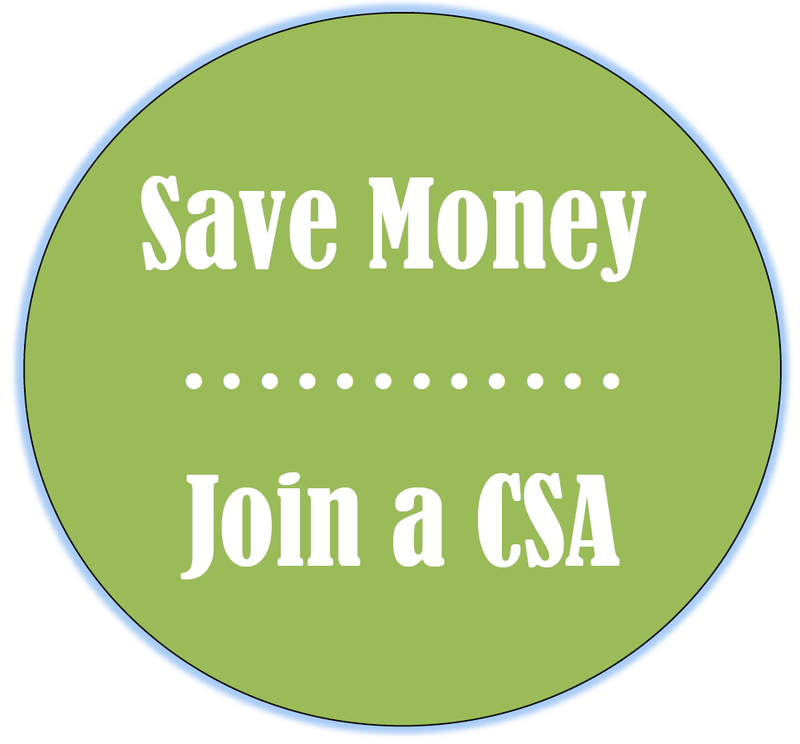 Not only are CSA’s a great way to support the local food system, to get organic produce into your kitchen, and to get to know the farmer who grows your food – they are also an amazing bargain! And I love the rhythm of picking up my produce each week and then putting together a meal plan based on what’s ready to pick at the farm. 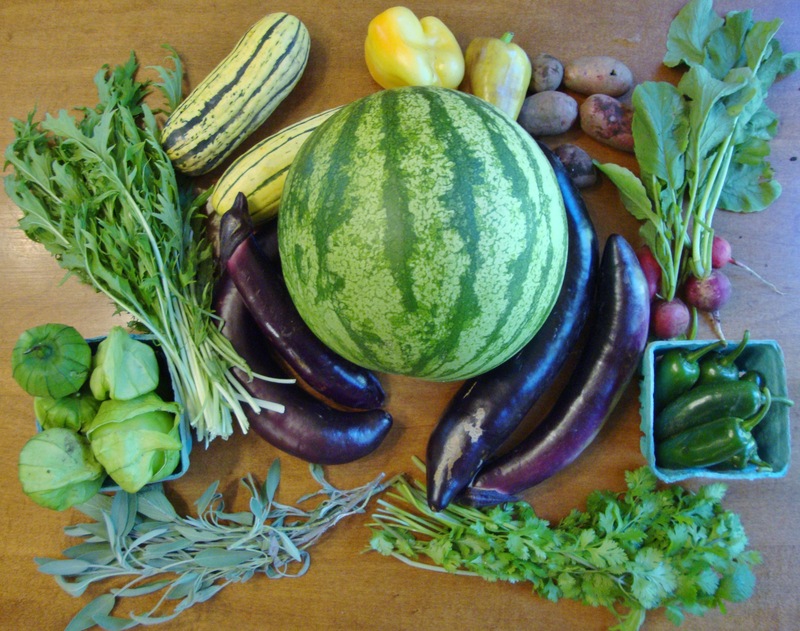 If you’re looking for a farm share near you, check out www.localharvest.org. Many farms offer shares all year long, even here in the northeast. If you’re in the Boston area, don’t miss the Boston Local Food Festival on October 7, 2012 at the Rose Kennedy Greenway. You will be able to learn about the local food that’s available in Massachusetts, sample some goodies, and buy unique local items at discounted prices. I’m looking forward to it! Linking to Small Footprint Friday, Fresh Bites Friday, Fight Back Friday, Freaky Friday, Frugal Friday, Monday Mania, Fat Tuesday, Traditional Tuesdays, Frugal Tuesday Tip, Wednesday Fresh Foods, Real Food Wednesday, Whole Foods Wednesday, Frugal Days, Sustainable Ways, Healthy2Day Wednesday, Simple Lives Thursday, Frugal Food Thursday, What’s in the Box? A recent outbreak of salmonella was linked to Trader Joe’s peanut butter. 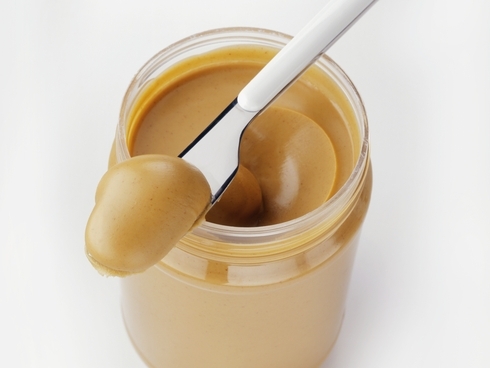 The recall has been expanded to include 76 peanut butter, almond butter, and cashew butter products sold at many different stores. This outbreak caused people to become sick between June 11 and September 2, 2012. Take a look at the list linked below and check your cabinets! 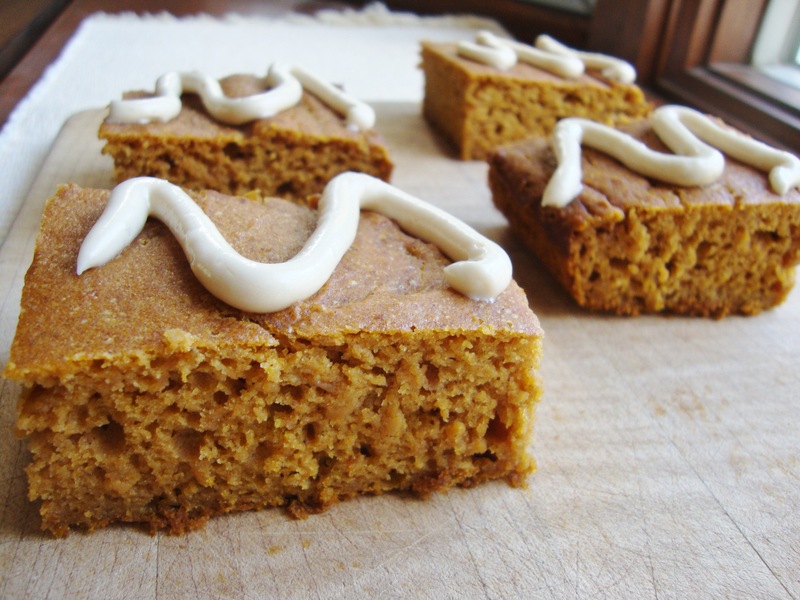 This pumpkin cake is the perfect snack with a cup of tea. Fall is here, so it’s pumpkin time in my house. I’ve been perfecting this pumpkin cake for years. It’s one of my favorite treats in the fall, and I can feel good about eating it. I find that pumpkin recipes don’t need nearly as much oil or added moisture as other baked goods because the pureed pumpkin is so moist. This recipe uses gluten-free flour, but it also works well with white whole wheat flour. Add the dry ingredients to the wet ingredients and stir until well-combined. Bake for 25-30 minutes, until the cake is set and a toothpick inserted in the center comes out clean. Combine all ingredients in a stand mixer and mix until well-combined and smooth. When the cake has completely cooled, spread the icing on the cake. I used this fun new cupcake decorating tool that I recently bought. Linking to Fat Tuesday, Real Food Wednesday, Whole Foods Wednesday, Gluten-Free Wednesday, Allergy-Free Wednesday, Eat Make Grow, DIY Thrifty Thursday, Frugal Food Thursday, Keep It Real Thursday, Simple Lives Thursday, Fight Back Friday, Fresh Bites Friday, Gluten-Free Friday, Fit and Fabulous Friday, Foodie Friday, Snacktime Saturday, Show and Tell Saturday, Melt in Your Mouth Monday. When I saw this month’s Recipe Redux theme, I was excited to get to work on it. We were challenged with the task of creating a recipe using fermented foods. I’ve been making my own Greek yogurt for a while now, and the by-product is a big bowl of whey. 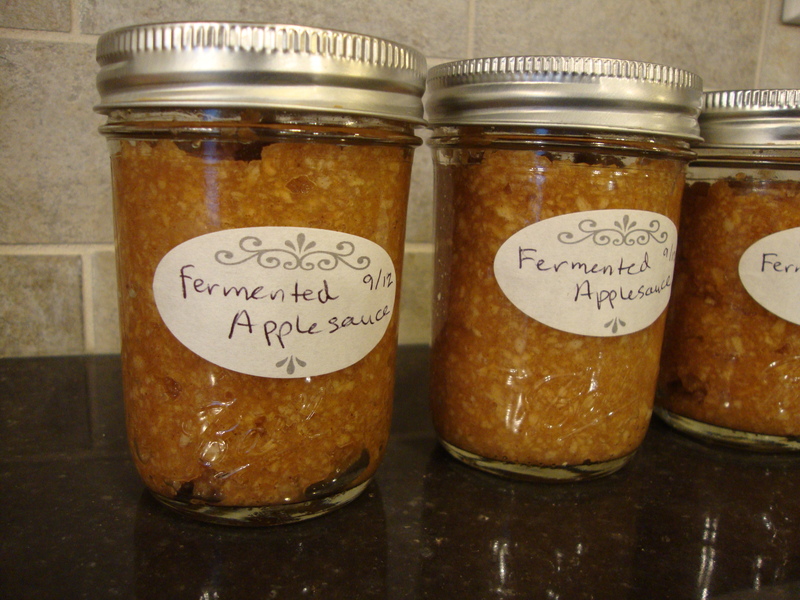 I’ve been looking for new uses for the whey, and I came across this recipe for fermented applesauce from Whole Foods on a Budget. I adapted her formula and added my own flavor combination. The result is delicious. Besides tasting great, this recipe is easier to make than traditional applesauce because you don’t have to cook the apples. More importantly, the fermentation process makes foods easier to digest, it increases their vitamin levels, and it produces enzymes that are healthy for the gut. If you don’t have any whey, buy a small container of plain, whole milk yogurt (not Greek) and strain out a tablespoon of the liquid. That’s whey. Place the apples in a food processor or blender. Add the remaining ingredients and pulse until you have a smooth, evenly seasoned applesauce. Taste and adjust seasonings as needed. Transfer the mixture to 3 or 4 half-pint canning jars, leaving an inch of headspace in the jar. The headspace is important because the fermentation process can cause pressure from inside the jar. You don’t want an explosion of glass and applesauce. Leave the jars on the counter for three days, and then transfer to cold storage. This batch of applesauce costs $1.87, or $.62 per cup. There was a hail storm in June that left some apples at a local orchard with little dots on them. They were at the discount rack in the back of the shop, and I got a bunch of them for $.99 a pound. Where I live in Massachusetts, this is actually a great price for local apples. 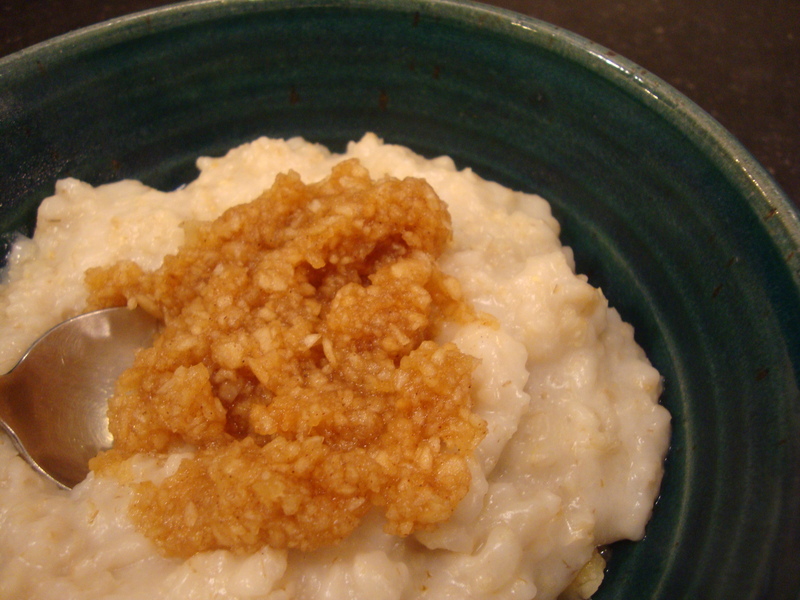 The applesauce I buy at Target costs $.50 per cup, but it lacks the unique flavoring and fermentation benefits of this homemade version. Linking to Gluten-Free Fridays, Healthy Vegan Friday, Wellness Weekend, Traditional Tuesday, Freaky Friday. I love making my own yogurt, and sometimes I’m looking for unique ways to use it. 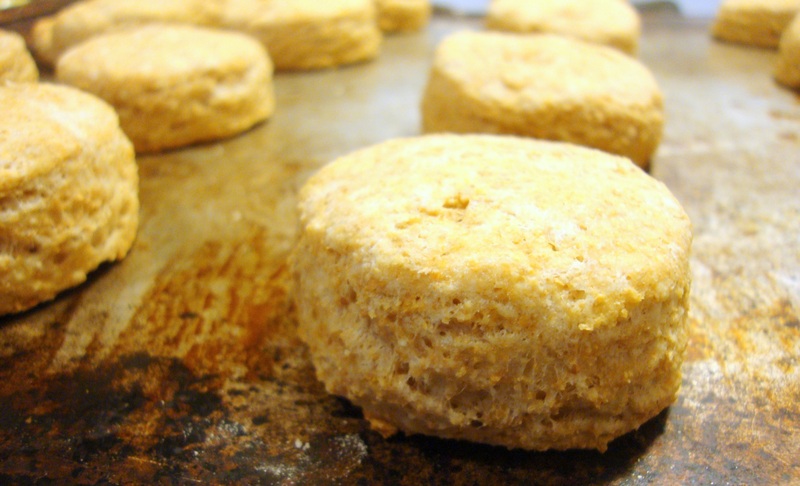 These yogurt biscuits are easy to make and they have a delicious flavor. My children would happily eat a plate of these for dinner, and I sometimes find myself using them as a reward to get the kids to eat a less desirable item on the menu. The biscuits freeze well, so I like to put some of them in the freezer for a time when I need that extra something to complete a meal. This recipe is adapted from a biscuit recipe in Mark Bittman’s How to Cook Everything Vegetarian. Add the ghee and pulse until combined. It should have a crumb-like texture. Remove the mixture into a large bowl and stir in the yogurt. The dough should be moist, but not too sticky. Flour a work surface and roll the dough to a thickness of ½ inch to 1 inch. Cut the dough into 2-3 inch circles, and place the discs on a baking sheet. 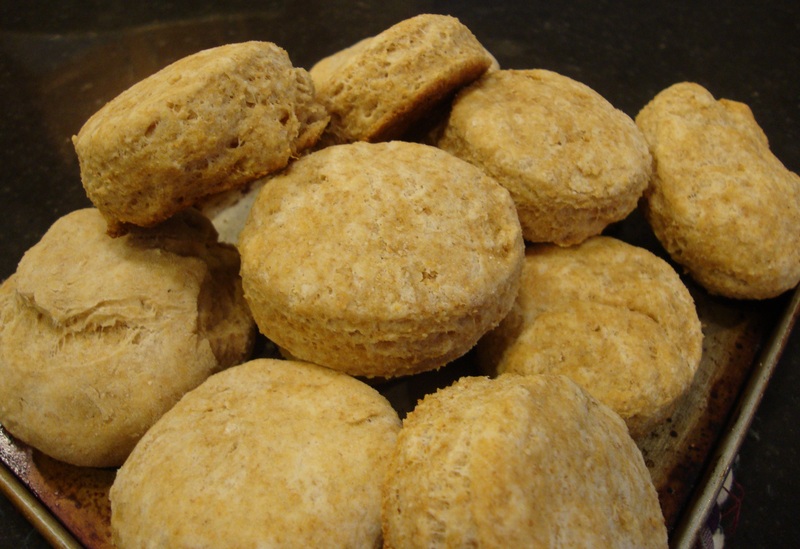 This recipe costs $1.19 to make, or $.07 per biscuit. These are a great whole grain addition to many different types of meals, and they just might be good enough to get your children to eat their Brussels sprouts. Linking to Frugal Food Thursday, Your Green Resource, DIY Thrifty Thursday, Frugal Friday., Monday Mania, Frugal Tuesday Tip, Frugal Days, Sustainable Ways, Healthy2Day Wednesday. © The content, opinions, recipes, and deals presented in this blog are those of the blog’s author/owner unless otherwise noted. Unauthorized use and/or duplication of this material, including photos, without express and written permission from this blog’s author/owner is strictly prohibited. In such case as permission is granted, full and clear credit must be given to Real Food, Real Deals with appropriate and specific direction to the original content.